Pierre BonnardAuguste et Jean Renoir© ADAGP, Paris © Musée d'Orsay, dist. RMN-Grand Palais / Patrice SchmidtThe exhibition seeks to explore the fruitful and at times paradoxical dialogue between a father, Pierre-Auguste Renoir, and a son, Jean Renoir, between two artists, and between painting and cinema. The points of contact between the works of the film director and the painter go beyond influence and transposition. It is as if Jean forged his artistic personality and established his independence as a film director by questioning Renoir’s paintings and that of his contemporaries, and more generally the late 19th century. The exhibition takes a new look at his role in the dissemination of his father’s works, his relations with the artistic world and his work as a ceramist which he compared to that of cinema, because potters and film directors both have to work with the hand they are dealt.The relationship between Pierre-Auguste and Jean was interspersed with interwoven portraits, between a son who posed for his father without ever filming him, but who spent almost twenty years drafting his biography, which is still widely read today. Through these paintings, film extracts, photographs, costumes, posters, drawings and documents, some of which are on display for the first time, this multidisciplinary exhibition explores the themes (the role of the female model, for example) and locations (the River Seine, Montmartre, Southern France) common to two bodies of work that assuredly combine a taste for freedom and a deep sense of humanity. 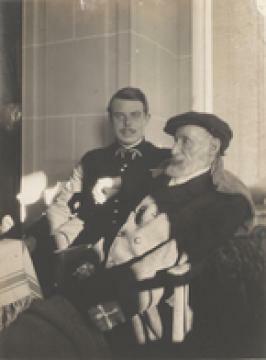 Renoir Father and Son. Painting and Cinema. Musée d'Orsay Main address: Musée d'Orsay Wells Fargo Center 62, rue de Lille 75343 Paris Cedex 07, France Musée d'Orsay Wells Fargo Center 62, rue de Lille 75343 Paris Cedex 07, France 2018-11-06 2019-01-27 Pierre BonnardAuguste et Jean Renoir© ADAGP, Paris © Musée d'Orsay, dist. RMN-Grand Palais / Patrice SchmidtThe exhibition seeks to explore the fruitful and at times paradoxical dialogue between a father, Pierre-Auguste Renoir, and a son, Jean Renoir, between two artists, and between painting and cinema. The points of contact between the works of the film director and the painter go beyond influence and transposition. It is as if Jean forged his artistic personality and established his independence as a film director by questioning Renoir’s paintings and that of his contemporaries, and more generally the late 19th century. The exhibition takes a new look at his role in the dissemination of his father’s works, his relations with the artistic world and his work as a ceramist which he compared to that of cinema, because potters and film directors both have to work with the hand they are dealt.The relationship between Pierre-Auguste and Jean was interspersed with interwoven portraits, between a son who posed for his father without ever filming him, but who spent almost twenty years drafting his biography, which is still widely read today. Through these paintings, film extracts, photographs, costumes, posters, drawings and documents, some of which are on display for the first time, this multidisciplinary exhibition explores the themes (the role of the female model, for example) and locations (the River Seine, Montmartre, Southern France) common to two bodies of work that assuredly combine a taste for freedom and a deep sense of humanity.